Woody Harrelson is starring in a new drama called Rampart. I haven’t seen it yet, but I’ve heard it is pretty solid. Hi Reddit, it’s Woody here. I’m in New York today doing interviews for my new film RAMPART, which opens in theaters on February 10th. I’ll be checking in from 3-4EST today and will get to as many of your questions as I can, so start asking now! Be back soon. A deluge of questions followed, as is typical for these AMAs. However, either Harrelson or the PR people running his account were instructed to only answer questions about Rampart (or in ways that referred explicitly to Rampart). In fact, if you read some of his answers, they sound like they’re coming straight out of a press kit for Rampart. 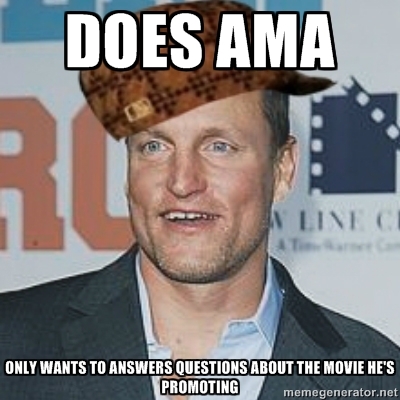 As a result, Harrelson ignored the vast majority of other non-related questions, thus violating the “spirit” of Reddit’s AMA section. Subsequent to this was a Reddit backlash the likes of which has rarely been seen. Reddit was outraged (OUTRAGED!) that Harrelson had attempted to use the site to brazenly promote his new film. But while others have done this sort of promotion in the past (e.g. Louis CK), Harrelson’s attempt struck the community is totally inauthentic and blatantly self-serving. The site is now awash with meme pictures of Harrelson, unpleasant trivia about Harrelson’s family, as well as rumors of some kind of sexual liason that Harrelson ostensibly participated in with a high school student in LA. PR professionals, take notice: do not toy with forces beyond your control or understanding. Speak to communities such as Reddit correctly and they will reward you with lavish praise and tons of page views. But do it with a hint of insincerity and they will respond with the anger of a thousand suns.